No cliches. No cheese. No camera-club jargon. 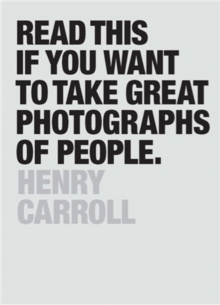 This straight talking introduction to photographing people is the hotly anticipated follow up to the bestselling Read This if You Want to Take Great Photographs. Ideal for users of any camera with a basic knowledge of a few photo-fundamentals, this book walks you through the essential techniques of photographing people, whether it's on the street, at home or in the studio. Packed with iconic images by acclaimed photographers, it gives you the inspiration and knowhow needed to get out there and take great photographs of friends, family and everyone else. 50 master photographers including: Richard Avedon, William Klein, Cindy Sherman, Garry Winogrand, Richard Renaldi, William Eggleston, Sebastiao Salgado and Henri Cartier-Bresson.